No more drafty fireplaces! 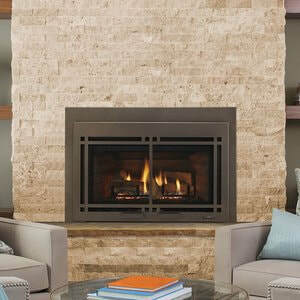 Update your drafty, inefficient masonry fireplace with a Direct Vent gas fireplace insert. Save money by turning down your furnace and using zone heating. Enjoy consistent, controllable heat even during power outages. 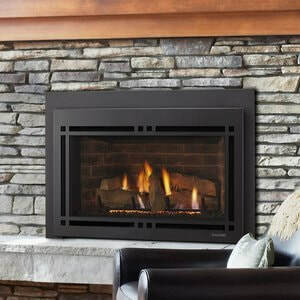 Add value and efficiency to your home with a gas fireplace insert. Heats up to 1400 sq ft.
Heats up to 1800 sq ft. Enjoy the combined power of radiant and convective heat with maximum viewing area. 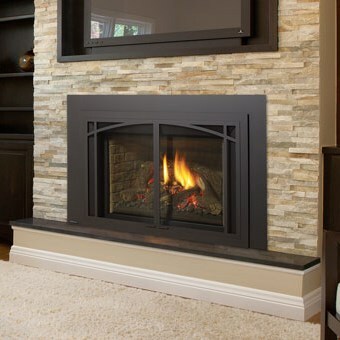 Extend the fireplace season with the low turn down capability. Combines intense radiant heat to instantly warm the area in front of your fireplace, adds natural convection and pushes all that heat to the far corners of your room with a standard heat circulating blower. This gas insert includes electronic ignition and a variable speed blower. Designer options provide you with a customizable look. This large, high efficiency heater provides intense radiant heat instantly. into the far corners of your room. 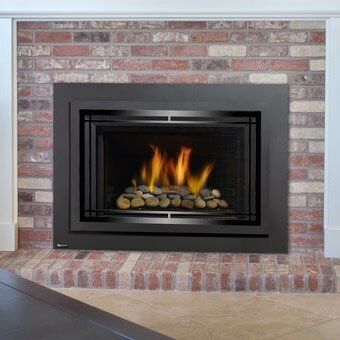 This Vesta award winning fireplace insert is designed to fit the smallest fireplace openings but offers a large, 400 square inch ceramic glass viewing area. Features Napoleon’s exclusive NIGHT LIGHT™ and comes standard with a thermostatic remote control and MIRRO-FLAME™ Porcelain Reflective Radiant Panels. Easily transforms your existing masonry or prefabricated fireplace into an efficient heating source, eliminating drafts and ultimately saving you money. Good things come in small packages! The Napoleon Infrared™ X3 Gas Fireplace Inserts contain a modulating dual burner system that results in a firebox filled with a stunning triple flame pattern. Offers many standard features including Napoleon’s IRONWOOD™ log set that fills your firebox with beautiful YELLOW DANCING FLAMES®. An impressive 563 sq. in. clean face viewing area and a multitude of designer accessories, it’s a perfect choice for larger rooms where a passion for luxury is evident.